Read our story below on honeymooning in the Yucatan peninsula from our Spring issue of Mexico Weddings & Honeymoons magazine. Enjoying a drive down Mexico Highway 180 from the Yucatan capital of Mérida to the neighboring state of Campeche, I slowed and turned off at the town of Maxcanu to buy some water and road snacks. As I drove around for a couple minutes, a bit lost, I somehow managed to stop next to a small square. This would be the first of many unique experiences I was to see while embarking on a five day drive throughout the Yucatan peninsula. A journey that would take me from the colonial cities of Mérida and Ca mpeche, visiting the beach towns of Celestun and Progeso, and on to the Mayan sites of Dzibilchaltún and Uxmal. All in the name of honeymoons, or should I say a unique, off-the-beaten path honeymoon. Not typical of your standard honeymoon, but not all honeymooners are typical. Was I on my honeymoon… no, but I was researching this article for the potential honeymooners. Don’t get me wrong, my own honeymoon was spent at a beach resort relaxing, eating, and enjoying the surroundings. But what if you wanted a different experience, a peaceful jaunt through the history and culture of Mexico as newlyweds… Well, you’ve found it here in the Yucatan peninsula. Although Maxcanu is one of the many peaceful villages you will encounter in the Yucatan, what caught my eye was the gentleman on the ladder across from my car. And oddly enough, I noticed that I had caught his eye too. I’m sure he was thinking ‘what the heck is this gringo looking at?’. Immediately, he motioned for me to come his way as he lowered himself from the ladder. As I crossed the street, I then noticed what he was doing; replacing the thatching on the palapa roof of his casa. He spoke no English, but was clearly motioning with his hands to see if I would like to help. Yes, I would. I loved it and truly felt blessed to weave the material for a small section of his roof. We both laughed, shook hands and said adios. One in many unique experiences on this trip. My round trip loop began the day before when I flew into Mérida from Mexico City. Called the White City because of it‘s many opulent colonial mansions, it was once the king of Henequen, or Sisal, (a rope making material) production for the world. Mérida and the surrounding Yucatan was one of the weatlhiest areas of Mexico at one time. I had reservations at Hotel MedioMundo, a charming 12-room inn with a pool and delicious, fruit breakfasts. The truly amazing owners Nicole and Nelson filled me in with all the local insight I could want. With the knowledge that I would be leaving in the morning for Campeche, I decided to head down to the colonial center and the zocalo (the main plaza) for dinner. I wanted to try the traditional Yucatecan dish of cochinita pibil (pork, various spices wrapped in banana leaves). It was delicious and unique, highly recommended when visiting the Yucatan. The surrounding blocks are filled with restored colonial residences that now house small inns, restaurants, and galleries. The zocalo was pleasant and seemed to be full of everyday living; the locals, ex-pats, and tourists mingling in the crowd. I also happened to be there on a Thursday, when they offer a free, traditional concert and dance in nearby Santa Lucia park. Wonderful. Back on the road to Campeche City on Friday, after my dip into the cultural traditions of the Yucatan in Maxcanu, I enjoyed the freshness of the air as I drove through thick, greenery along the route. Several hours after leaving Mérida I found myself entering the colonial city of Campeche along the Gulf of Mexico. Once a Spanish fortress city defending itself from pirate attacks from the sea, Campeche retains it’s Spanish colony feel, though different from Mérida. I checked in the Hotel America for a one-night stay. The price was right and the hotel staff were friendly. Accommodations were surely adequate for myself, but honeymooners may or may not want to select a more romantic and luxurious hotel. However, the location of the hotel was supreme. To experience the days of the Spanish throne and pirates, stay in the colonial center of the city. That afternoon and evening were spent exploring the streets near the center of the city, the fortification walls surrounding the center, the seaside walk or malecon, the zocalo, and maybe the most famous visual aspect of Campeche, it’s pastel-colored buildings. Straight out of Disneyland, however, with one big difference; relatively few tourists. Understanding my time was limited, I woke early Saturday morning in order to give myself ample time to explore Campeche’s famous fort. After a very good and authentic early lunch of ceviche and shrimp cocktail, I needed to head back towards Yucatan state. In the next three days I had archaeological ruins, flamingos, beaches, and cenotes to see. Next stop, Celestún, which is to the west of Merida about an hour’s drive if you don’t stop along the route visiting each village and hacienda you see…. as did. Luckily, I was staying a the very peaceful and romantic Ecoparaiso Xixim Hotel. For this small fishing and ecological village to have this rustically luxurious inn was a treat and a certain stay of honeymooners or even perfect for a small wedding. It was a bonus to stay in these relaxing accommodations, but I had come for the flamingos which are found in the Celestún Biosphere Reserve. The friendly director of the hotel, Verena Gerber, had set up a guided tour of this long, saltwater inlet. Not only did we view vibrant flamingo colonies, but we found many other birds and aquatic creatures, a “petrified forest”, fresh water swimming holes, and a small restaurant with freshly caught fish from the Gulf of Mexico. Rising early the next morning, and after one of the quietest sleeps in sometime, I enjoyed a healthy breakfast pool-side while glancing out into the Gulf of Mexico. Saying goodbye to Celestún wasn’t easy, I could easily have stayed a couple more days. 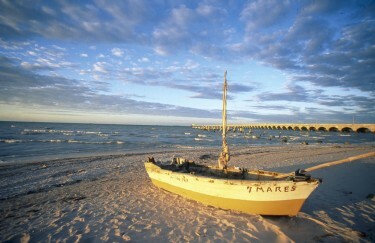 But I needed to get on the road back to Mérida, the hub of all my excursions throughout the Yucatan peninsula. I had another beach town to visit, Progreso, and Mérida’s nearest Mayan ruins: Dzibilchaltún. Try saying that three times fast. Dzibilchaltún (pronounced dzee-beel-chawl-TOON) is located about 10 miles from Mérida and was believed to have been one of the larger cities in Mexico at Mayan times. The small INAH museum was helpful and well maintained. The grounds are large so be prepared to walk. Then be prepared to be rewarded for your explorations with a swim in a cenote; a fresh water swimming hole common throughout the peninsula. Xlacah, the name of this cenote, is open to the public. This being a Sunday, it was a little busy in the water, but relaxing just the same. Dzibilchaltún can be a little overwhelming with so many structures spread over such a massive area, a favorite of mine was the Temple of Seven Dolls, but it is also peaceful with a glaring lack of tourists while Chichén-Itzá and Uxmal, the most famous of the sites, receive many. Another stop on the way to the coast was Hacienda Xcanatun, a small, elegant 18-room hacienda perfect for weddings and honeymoons. The management was very friendly and allowed me to walk the grounds. I discovered a calm environment of times gone by, of the Yucatan‘s hacienda era. Amenities included a couple pools, spa, and a restaurant. Next time through, I think Hacienda Xcanatun will require a stay. Arriving in Progreso in the afternoon, I felt like I was on a Caribbean island. The main road into town ends near a massive, but unique pier used for shipping products and at times for cruise lines. 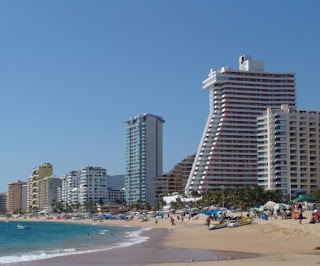 However, this is not a cruise town, just a laid back beach town with a working port. I had made arrangem ents for an overnight stay at a private villa on the beach between Progreso and the small town of Telchac Puerto. I wanted to review another option for lodging in the Yucatan after previously staying at colonial inns and eco-resorts with a hacienda to follow. It was incredible with beautiful sandy beaches and warm, clear waters. I found a local restaurant, enjoyed the specialty of the house; fresh grilled fish, and fell asleep to the sounds of the sea in my villa. Up early again, par for the course, I drove back to Mérida. This would be my last day and night in the Yucatan as my flight home was leaving Tuesday in the early afternoon. 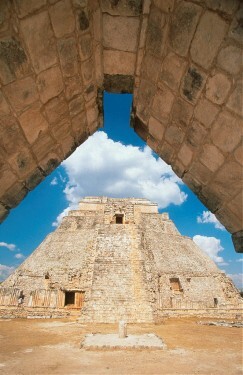 Today, I was heading for the famous Mayan site of Uxmal (OOSH-mahl). 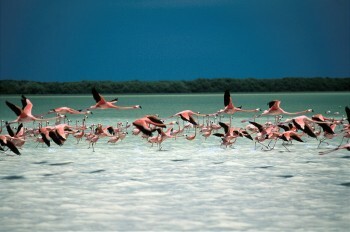 This World Heritage site is located about 50 miles southwest of Mérida. Arriving in the early afternoon, I gave myself a couple hours to explore the large pyramids and buildings on the ground as recommended by most guidebooks. Being a Monday, I definitely missed the crowds of the weekend. The House of the Magician, a 100-foot high pyramid, was breathtaking. I was impressed, as I walked around the Governor’s Palace, a large ball court, and the Nunnery, how these structures and grounds are so well preserved. And each night, there is a spectacular light show. As the day moved into early evening, it was time to check into my lodgings for the night; Hacienda Temozon. Managed by The Luxury Collection of Starwood Hotels & Resorts, this stunning property lived up to it’s billing as luxurious. 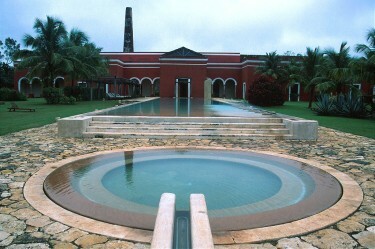 And I am told they have five haciendas throughout the Yucatan in which to stay; perfect for honeymooners. Amenities include a pool, spa, tennis courts, and even a cenote on the property. This former important Henequen hacienda has been transformed into a 28-room resort with 5-star amenities and services. Guests feel pampered, as if you are the only ones at the hacienda. Dining at the restaurant was a treat as I tried their European-Mexican or Mestizo cuisine menu. After my meal, I decided to walk to the pool and reflect on my adventure. In the morning I had a 35-minute drive to the Mérida airport for the flight home. I knew I had only scratched the tip of places to visit in the Yucatan peninsula. I had many other places such as Rio Lagartos, Chichen Itza, Ticul, Valladolid, and Ek Balam on my list, but those destinations would be for another time. The Yucatan is a large area, but is perfect to drive around and make your own itinerary. As I sat in the warm, still night, I wondered what one word would describe these last five days for potential honeymooners. Unique. Unique stood out. From the first moments of the trip through tonight, this had been a truly unique adventure throughout the Yucatan peninsula. The high season and best weather is found from November to April. The low season runs from May until October and coincides with the rainy season. It can also be hot, but bearable in summer. The plus? Prices are lower for lodging and less crowds. Many airlines fly into Mérida's airport, some direct some with a stopover in Mexico City. Merida is about 200 miles from Cancun. Driving on the Cancun-Mérida toll road takes about three hours and costs over $30 USD one way. Mexico Weddings & Honeymoons magazine will present the Spring issue at Tianguis Turistico tourism show in Acapulco the week of April 25th-April 28th. If you are in Acapulco, we'd love to see you there. Greetings Mexico wedding & honeymoon fans. We've love to hear from you. We are taking an informative poll on the most romantic colonial cities to get married in. So wether you were married in a colonial city, on your honeymoon or just visited one, we'd love to hear from you. Please give us a couple choices in order of your favorite first if possible.